The Coos Art Museum's big biennial of Oregon art is a come-one come-all affair, with no gatekeepers. How's that work? You'd be surprised. COOS BAY – What if they gave a Biennial and invited everyone to join in? That’s not, of course, the way biennial art shows ordinarily work. From Venice to São Paulo to Shanghai to Sydney to Istanbul to Havana to Berlin to the Whitney in New York, biennials tend to be ambitious, careerist, elbow-throwing affairs, intent on one-upping the art world with the biggest names, the newest trends, the deepest scent of money, and the even deeper desire to shape the next chapter in the shifting story of global contemporary art. Competition is fierce, and acceptance into one of the big-name biennials can make an artist’s career. Or you could just invite any and all artists in the state of Oregon to drop by with up to three works, and then fit them all onto your museum’s walls. 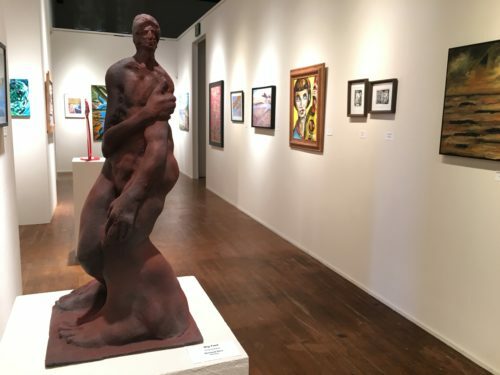 That’s the way it works at the Coos Art Museum on the southern Oregon coast, where since the 1990s a “come one, come all” approach to its biennial has prevailed and, perhaps astonishingly, largely succeeded. In a way, it can’t get more daring. The show has no gatekeepers. Museum officials don’t know who or what’s going to walk in the door. You trust that it’ll be good, or at least not embarrassing. And what you get, you show. If ever there was a People’s Biennial, a purely democratic approach to the state of the art, this is it. And people do show up. The current Coos Art Museum Biennial, which opened in October and continues through December 8, includes about 275 artworks sprawling all over the museum’s expansive main-floor galleries and into its smaller second-floor spaces. For the length of the exhibition it’s pushed pretty much everything except the small gallery devoted to the late Coos Bay long-distance runner Steve Prefontaine out of the picture, taking over even the climate-controlled upstairs gallery that usually houses rotating shows from the museum’s own permanent collections. 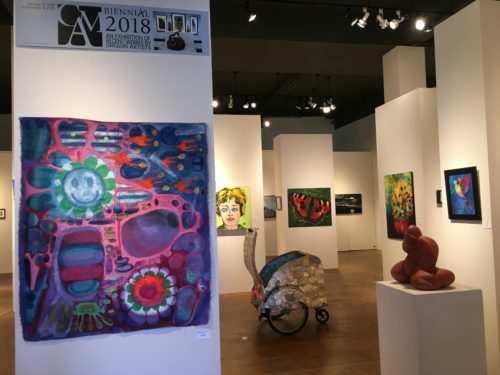 The CAM Biennial is a modest-budget operation, and most artists actually do “just drop by.” They bring their work to the museum and they pick it up after the biennial ends. 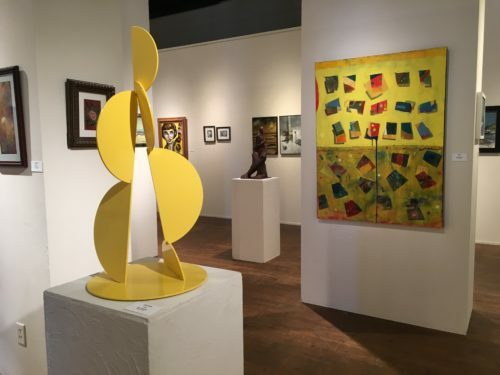 This explains, perhaps, the fact that most of the entries are from the south coast and the inland cities that parallel it, although the show also includes work from artists in Beaverton and other farther-flung areas. “Primarily it’s local,” Steven Broocks, the museum’s executive director, says. “But I remember the year that Tom Clevenger showed up with his three wood pieces packed on his motorcycle from Joseph,” in the far northeast corner of the state. And how does this radically democratic-verging-on-anarchic show work? Better than you might think. Yes, it has its share of ordinary or nostalgic work. But it also has a vibrant sense of celebration, of art-making as both an individual and a community pursuit: I’ve seen a lot of curated shows that provide less sense of purpose and pleasure. There is color, color, everywhere, and the smart installation, especially in the main floor galleries, is made up of de facto color corridors: yellow down one lane, red down another, giving the sense that you’re moving through something and toward something. Sometimes an artist’s three works are clustered together. Sometimes they’re scattered to fit a broader visual scheme. The show includes a lot of well-made craft, in wood, fabric, and metal, which isn’t surprising: Oregon has a long and rich history as a hotbed for craft art, despite the misfortunate demise of Portland’s Museum of Contemporary Craft, and craft remains especially strong in more rural areas of the state. A case in point is the trio of quietly dynamic 3D inlaid wood pieces by Brian Childers of Brookings, down the coast on the California border, which are sort of Mondrian meets Fallingwater meets master cabinetmaker. 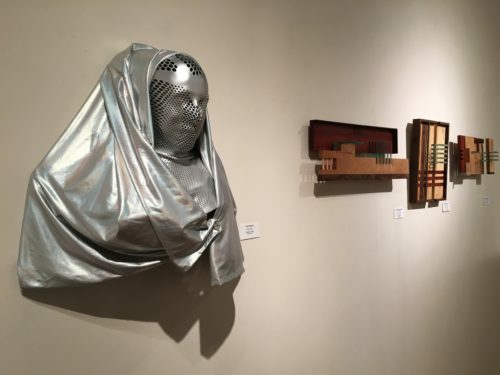 And North Bend artist Carolyn Long’s sculptural assemblage The Healer, a spectral figure with a gray mesh head and a silver cowl that hangs alongside Childers’ wood pieces, creates a startling, enigmatic presence. I was taken by, among others, the sly polyurethane sculpture Big Feet, by Richard Herr of Bandon, which is just that, and had me involuntarily humming Fats Waller’s Your Feet’s Too Big in my head; Pork Slider, by Alan Bartl of Coos Bay, an electrified bike trailer covered in blinking lights and metal can lids that are carefully nailed and rounded so their edges aren’t sharp, and which carries echoes of Robert Arneson and California funk; the large puckish oil painting A Perplexing Situation, by David Castleberry of Coos Bay, a coterie of cacti in conversation looming over the artist’s-eye underview, and his oil The Headlands, with its ripples of ocean over a march of rocks standing up in the sea; and the acrylic painting Tranquility, by Twana Gulseth of Coos Bay, a still life of iris-looking flowers that pushes acrylic to a marbled, almost metallic sheen. The art in this biennial seems largely personal, inviting direct emotional and aesthetic engagement. I saw little that seemed to pointedly engage contemporary political and cultural issues, or that was overtly conceptual, or even art that seemed to directly address the large environmental and economic questions confronting the state. It could be that such art and artists in Oregon are concentrated in metropolitan Portland and the corridor down to Eugene. Then again, it’s not as if those artists weren’t invited. All they had to do was drop by.